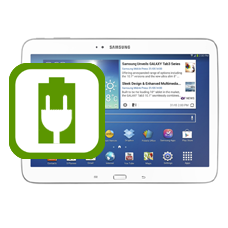 Does your Samsung Galaxy Tab 3 10.1 GT-P5210, GT-P5200 or GT-P5220 no longer charge or connect with a computer? Usually it is the USB dock connector at fault, we can replace your Galaxy Tab 3 10.1 USB charge connector. If your Samsung Galaxy Tab 3 10.1 GT-P5210, GT-P5200 or GT-P5220 shows these symptoms, then this is the repair service you will need. A broken Samsung Galaxy Tab 3 10.1 USB socket dock connector is classed by Samsung as a non-warranty repair and they will charge you accordingly. Our Galaxy Tab 3 10.1 docking port repair service is a cheaper option and performed to exacting standards, using only genuine original Samsung components. * Price includes a brand new Galaxy Tab 3 10.1 USB dock connector assembly, fitting and fully insured return shipping in the UK. This is an in-house Samsung Galaxy Tab 3 10.1 dock connector repair service, when ordering this Galaxy Tab 3 10.1 socket repair service you are required to ship the tab into our repair centre for works to be completed.